Welcome to the Chickasaw Cultural Center. This world-class destination is devoted to sharing and celebrating Chickasaw history and culture. As one of the largest tribal cultural centers in the United States, our ongoing mission is to make you feel at home. With our showcases, interactive media stations and hands-on demonstrations, we have consciously departed from the traditional museum “displays-under-glass” format to give you the closest connection with our culture. The Chickasaw Cultural Center has been a vision of Chickasaw people for many years, born of thousands of hours of inspired planning, design and labor. The story of Bedré Fine Chocolate began over four decades ago, and in 2000, the Chickasaw Nation purchased the company and gave it new life. Building on a rich legacy and love of curating the bold and delicate flavors of chocolate, the Chickasaw Nation turned the small chocolatier into a nationally recognized luxury chocolate brand. The First Encounter Documentary portrays the actions taken by the Chickasaw that proved to be the catalyst for the dwindling of Hernando de Soto’s mission for gold and riches in America during the late 1530s and early 40s. Chickasaw Special- Indian Taco, Pashofa, Grape Dumpling and a fountain Beverage. The Chikasha Poya (“we are Chickasaw”) Exhibit Center is a state-of-the-art interactive exhibit gallery that chronicles the history of our people. It contains both permanent and rotating collections and hosts classes, lessons and special events throughout the year. The Chikasha Poya Exhibit Center houses the Spirit Forest, Council House Orientation Theater, and the interactive Removal and Stomp Dance displays as well as an extensive artifacts gallery. This historically accurate village takes you back in time to native Chickasaw villages. It includes many of the structures central to daily life. 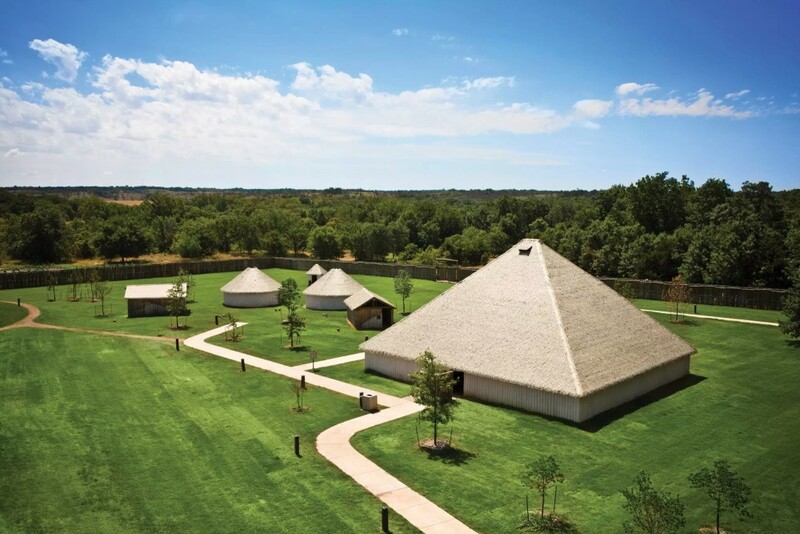 Images of the Chickasaw Cultural Center courtesy of Chickasaw Country.